Holiday.gr - Acharavi, a trip to a myth! Another tourist resort of Corfu, located in the southwestern part of the island, 37km from the city, and a pole of attraction for tourists. The settlement of Acharavi is built in a lowland, characterized by dense vegetation. 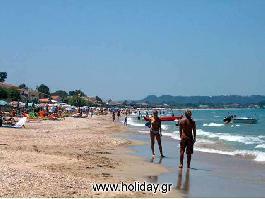 Very impressive is the extend beach of Acharavi, one of the biggest in Corfu. It has a length of more than 80km(!) while its shallow waters are ideal for small children. It is a highly organized beach equipped with the appropriate foundation for water sports and games. Along the coastal road are a lot of taverns and coffeehouses. As for your accommodation you will find many hotels and rooms to let in the region. If you are fond of sight-seeing and a lover of nature you can visit many villages such as the old Perithia, Sinies, Episkepsi and the remains of the Roman Spa. You will see the natural sites such as Lagoon Antinioti and the valley of Nimfon where the famous coum kouat is being cultivated. Been to Acharavi ? Share your experiences!